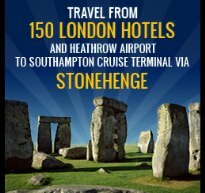 tour to Stonehenge along the beautiful Test valley ( transfer time 1 hour approx). tour to Woodhenge and Durrington Walls (where the builders of Stonehenge may have lived) and subject of a major National Geographic programme. tour the barrows, Cursus and the Avenue. Optional 1 hour walking tour. fast track entrance to tour Stonehenge. travel down the Woodford valley to Salisbury. Optional lunch at a traditional English pub or a cream tea in a delightful riverside garden. return to ship or airport. 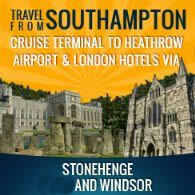 services of a highly rated Stonehenge tour guide ( see Trip Advisor box on Home page). tour in air conditioned executive model vehicle. Duration; 4 - 7 hours depending on your choice of itinerary. Further details Contact Us with your date of arrival, how many in your party, and how many hours you have to tour.